Why does this economically modest and destructive economic activity get so much priority? A recent report published by the Department of Interior demonstrates what conservation advocates have been arguing for years: Recreational use of public lands creates many more jobs and much more economic value than public lands ranching. Despite the staggering disparity in economic value of these competing land uses, the Bureau of Land Management continues to manage public lands to benefit public lands ranching above and beyond all other uses. 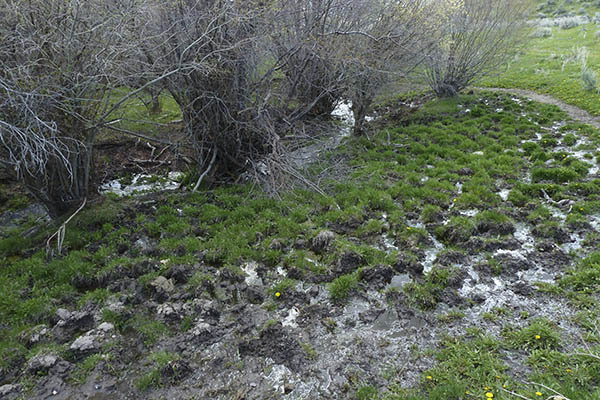 This emphasis on ranching frequently results in degraded conditions that reduce or even ruin recreational opportunities, displace wildlife, muddy and infect formerly pristine creeks, and ruin the scenery that attracts people to the great outdoors. Nobody wants to pitch a tent in cow waste, have their trip cut short by E. coli, giardia, or campylobacter or try to admire the view when it smells like a feedlot. In the photo above, cattle were put back on this already trampled grazing allotment just 3 weeks after the photo was taken. Thank you for the link to this report. Sent this on to Udall and Bennet’s offices….once again, the hypocrisy of the conservative states is on display..and they just shamelessly keep holding out their hands for Federal welfare checks, ruining resources, and bowing to the corporate interests. That Chimney Creek photo makes me recall similar scenes in the same area and even closer to Pocatello in the early 70s. I saw an area very similar to this one on BLM land in southeastern Arizona in 2009. What a shame. Ranchers are organized, politically active and write checks…the recreational people and the businesses they support, relatively, do not. Might be a lesson there. This is the route to political power — the one you mention above. However, I don’t think the power of ranchers comes very much from writing checks. There are not enough of them to make much of a difference even though some of them are mighty rich. In the case of ranchers, I think it is more one of cultural hegemony. Our dominant culture dictates that they command and we (like cattle and sheep) obey. Ralph, I am pretty sure that the stock associations fill campaign coffers as best they can. Most of these ranchers pay into a stock assoc PAC as well. I agree that culture plays a role, but any state senator smarter than the average bear is going to figure out whats fueling his campaign and it is not accolades from empty green pockets. This is where many on this blog misjusdged Obama in the early days. You had to see where his past big money had come from and how the Chicago/Ill system worked. Sure he told you guys what you wanted to hear, but the big checks spoke louder and all the little guys who chipped in $1s to make a bag full of millions failed to realize that their voice was still only valued at $1. I think sometimes evironemental folks so abhore the process that they would rather lose the fight then adapt to the realities of the battlefield. Ralph, I also note that they do a poor job of breaking out recreational dollars. If you dig deep enough it becomes clear that wildlife watching, hunting and fishing are included in their totals for “recreation” (along with atv’ing, boating, mntbikes, etc) and but that is of little help for the endless debates here on this blog about whose dollars are doing the most for the outdoors.